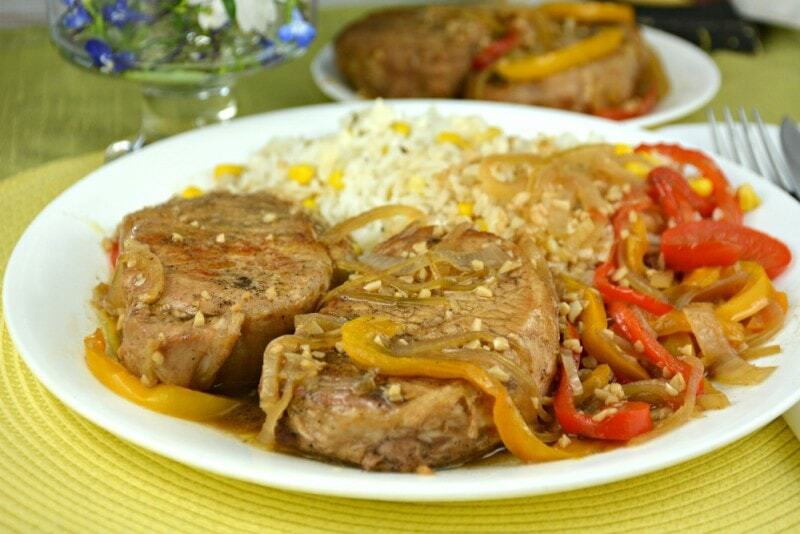 I always look forward to making these Balsamic Pork Chops with Wine and Garlic mainly because of the sauce. The sauce is what makes this dish stand out. It pairs so well with so many sides. We have eaten this dish over rice, various kinds of pasta, and even mashed potatoes. One side is as delicious as the next. Balsamic Pork Chops with Wine and Garlic is an easy and delicious recipe that is satisfying, every time! This recipe has been in my family for as long as I can remember. 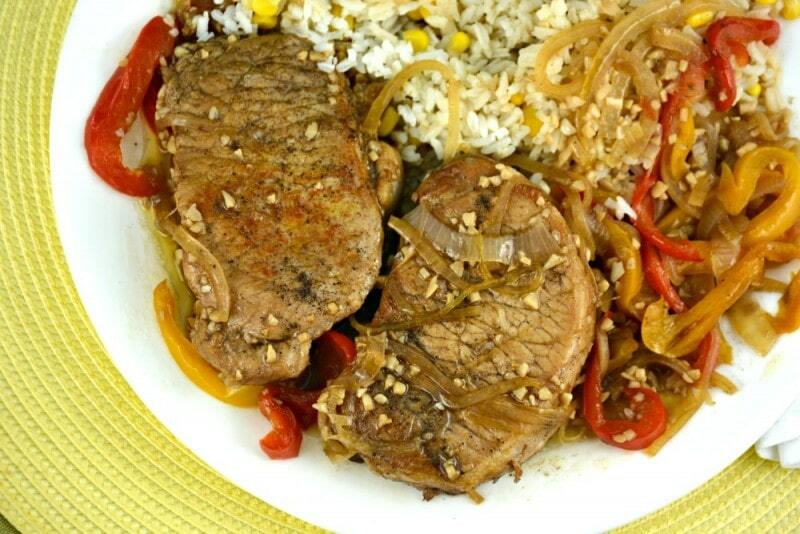 Balsamic Pork Chops with Wine and Garlic is just so darn good. It is one of those recipes you can put your own spin on, especially with the sides you serve with it. We also have tried different protein with it and loved each of them! In the original recipe it calls for one type of pepper. We often use several colors just for a little variety and color on the plate. If there is a better flavor pairing than garlic, onion, and wine, I just don’t know what it is! This recipe makes the most delicious sauce. I know I can’t seem to stop mentioning that it’s just that I think my favorite part is the sauce! I’d be a happy camper if I had this sauce in my fridge all the time. I always have to stop my self from eating just the sauce. I am exaggerating. Sort of. This is also a fairly quick meal. I love to have the depth of flavor in this dish in such a short amount of time. Again, it’s all in the sauce I tell ya! 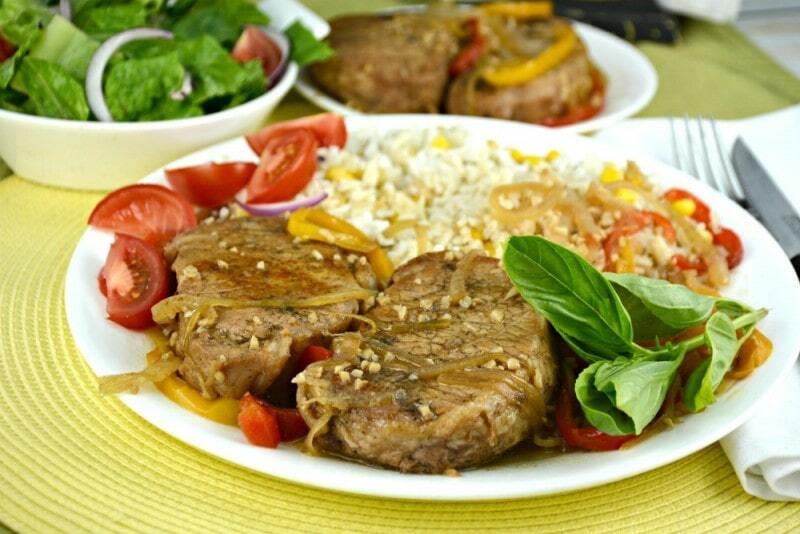 Our video for this Balsamic Pork Chops with Wine and Garlic recipe is ready! I am so excited for you to see it as this recipe is definitely worth a look! In a large skillet, over medium to medium high heat, heat oil and butter until it shimmers or a drop of water flicked in it dances. Sprinkle salt and pepper on both sides of your chops. Sear your chops until nice and brown, between 2 to 4 minutes per side. Transfer your seared chops from the skillet to a plate. Reduce heat to medium and add garlic. Stir until starting to brown. Add wine and bay leaves. Stir until reduced, about 10-15 minutes. Raise the temperature if you need to to thicken up and reduce the sauce. 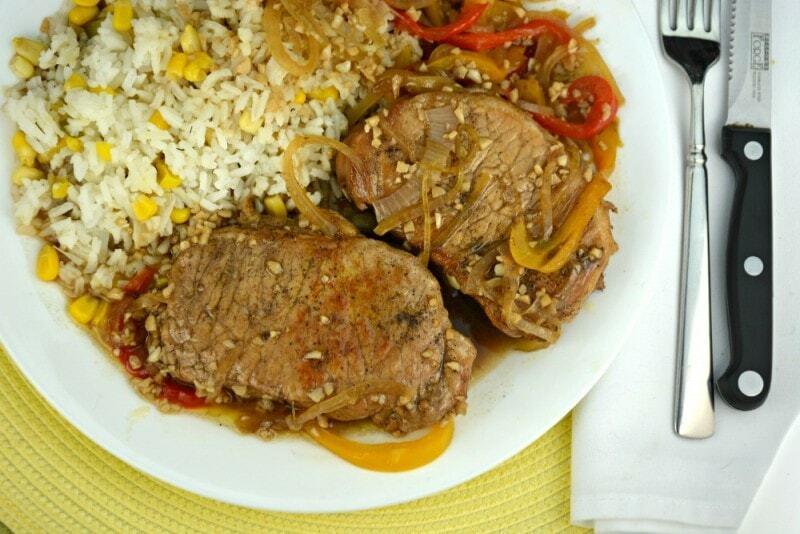 Add broth, onions, peppers and chops back into your skillet. Allow the chops to cook in the liquid for about 10 minutes, add more broth if you need to. Add balsamic vinegar and stir. Cook until your chops are done, cover if necessary. Remove chops and place on serving plates. Add in 2 tablespoons of butter and sprinkle in a little salt and pepper to taste. 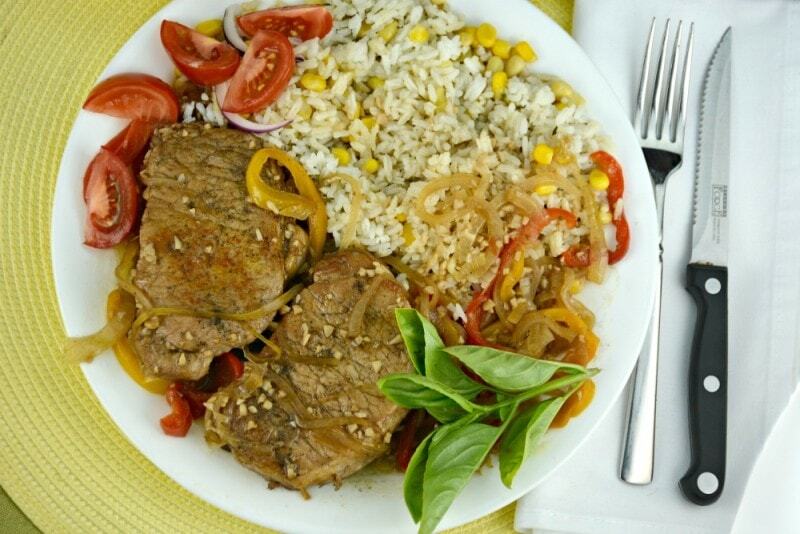 Serve mixture over top of your chops with rice and a vegetables or salad! Enjoy! This dish is delicious, just make sure it is reduced enough and you use a larger pan. I use a 10″ cast iron and should have used my 12″ stainless. I also added halved Brussel sprout, I love them with balsamic and they were great.